As Microsoft engineers burn the midnight oil, you'll see buffing, polishing...and Universal Office app pricing. Until July 29, Microsoft’s mission will be to polish, polish, polish Windows 10. With build 10240, released on Wednesday, the buffing brush has been taken to Microsoft’s Edge browser. But there’s a catch: the Office 365 subscription hammer’s coming down on the Office apps. 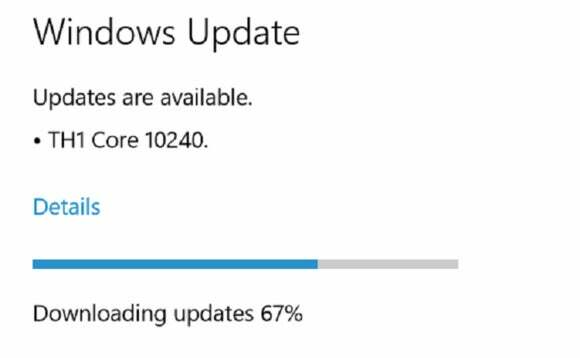 Microsoft released build 10240 on the Fast Ring of the Windows Insider program, via the Windows Update service. The update uses Microsoft’s “production” channels, as a test to see if they can withstand the millions of downloads that will take place on July 29. With the latest build, Microsoft has promised a “blazing fast” version of the Microsoft Edge browser, with benchmarks that the company claims are substantially faster than Google Chrome: 112 percent faster than Chrome on WebKit SunSpider, 11 percent faster than Chrome on its own Google Octane benchmark, and 37 percent faster than Chrome on the Apple JetStream benchmark. “We’re really pleased with those performance gains and we hope that you’ll enjoy faster browsing with Microsoft Edge along with the many great features we’ve added over the last several builds,” Gabe Aul, in charge of the Windows Insider program for Microsoft, wrote in a blog post. Why this matters: Windows 10 is almost, but not quite, done. With hardware makers now releasing the dates on which they’ll ship their PCs, the Windows 10 ecosystem is in the final sprint. Microsoft simply needs to make the experience as smooth as possible; engineers are certainly going to be burning the midnight oil in Redmond. But there is a catch: those nifty Universal Office apps will start checking that you’re signed up to use them. The apps, which automatically save updates to the cloud as you work on them, are being relabeled as Office Mobile (Word Mobile, Excel Mobile, and the like) to distinguish themselves from the Office 2013 and Office 2016 preview versions. If you happen to be running the Office Mobile versions on a tablet that’s smaller than 10.1 inches, good news: Viewing and most editing functions will remain free. But anything larger than that will require an Office 365 subscription, Microsoft said. You’ll be able to download Word and the other mobile versions of the Office apps from the Windows Store. The OneNote Universal app, however, will come preinstalled on Windows 10, Microsoft said. In that vein, Microsoft is also encouraging users to check out the Windows Store for updates to the Windows 10 apps. “Besides builds, over the next 2 weeks you’ll also see some Windows Updates and app updates in the Store, so make sure to keep checking for updates daily to make sure you’re running the latest and greatest code,” Aul wrote.